As part of my work with YoughalOnline.com I will be broadcasting a live gig from Claycastle Recording Studio, Youghal. This will be the first time a live gig will be streamed live from the studio. Receive again the security details for any Voucher. Check the balance and transaction history on your 3V Vouchers. Redeem money left on your 3V Vouchers to your bank account. Transfer money from one Voucher to another Voucher. Request a replacement 3V Customer Card. Update your personal details or password. Change how you receive the security details when you buy a 3V Voucher. You can also find the balance and transaction history for any 3V Vouchers quickly by clicking on the View Transaction History link on the left hand side of this page. The info that follows may have been a one off chance of gaining someones account information but non the less a weakness… try it yourself on your own account if you like! I hadn’t used my 3V account with over a year and had lost my card but also had forgot my account username and password, so a few weeks ago I tried the standard “Forgot Your Password” option on the website www.3v.ie and went through the various email address I may have used for that account. Unfortunately neither of my email addresses worked as the 3V website started to throw an error along the lines of “Cannot complete your request, please try later” etc. I called customer service and stated that I needed to retrieve my account information, I was asked for my registered email address and password. I then explained that I couldn’t remember my registered email address or password and that is why I was speaking to support on phone! What followed was clearly shocking! Support asked me for my mobile number which I gave, I was then told my email username was xxxxx@xxxxx.com with no problem….. at that point I was actually relived now to have at least my username so while talking to support I tried the “Forgot My Password” option on the website login and still got the “Cannot complete your request, please try later” response feeling annoyed I asked why it was not working for me and also sensing the support persons frustration as I was asked to repeat the request… but each time it failed and then out of the blue I was informed “OK your password is xxxxx try that” and yes I had my password and yes it did work!!! So what I’m saying here is if I was posing as another person and rang customer support armed with just a known 3V user and there mobile number I could easily retrieve their information by causing a flurry about why I cannot access my account for some reason or another using the flaw “Cannot complete your request, please try later” response” etc. This happend to me and made me realize I could have been someone else! or maybe… just maybe the customer support person could actually see I was trying to access the system at that point and felt confident I was the same person on the end of the phone and freely gave the details away? In the past few weeks I have upgraded my WordPress version from 2.3.1 to 2.3.3 and tonight to version 2.5 I must say everything went sweet! I actually like the new interface it’s much more condensed and customizing the dashboard is simple. The option to upgrade newer plugin versions via FTP is really cool! The image manager is excellent, I now no longer have to scroll down to the bottom of a post to insert images and the Gallery feature is a welcome. Toggle Full Screen mode is great and eliminates the double scroll bar issues when managing a long post. Just to note I have 7 various plugins on my blog and all work fine after re-activating them. Thanks to the team at WordPress for all your fine work! I decided to upgrade YoughalOnline.com WordPress version from 2.3.3 to 2.5 this morning using the excellent “WordPress Automatic Upgrade” plugin as recommended but not tested by Donncha at his blog. The auto upgrade plugin does exactly what it says on the tin, it was a blistering fast upgrade all in all in around 5 mins I had installed the plugin and had my files and database backed up, the new 2.5 version files were installed and the icing on the cake was my plugins were re-activated. There was an automated process but I didn’t go with that route as I like to see what happens etc. I would highly reccomend the auto-upgrade plugin, everything ran smooth! I mentioned above “Just to note I have 7 various plugins on my blog and all work fine after re-activating them.” I must say I ran into a fatal error with the “Popularity Contest” plugin version 1.3b3 from Alex King. To fix the error open popularity-contest.php and scroll down to line 59. YoughalOnline.com Live Web Broadcast A Success! I’ve been a little quiet here on my blog lately, much of the reason is my time is being eating up with the new venture www.YoughalOnline.com. I spoke about this in a previous post well I just want to update on the happenings with that website. We broadcasted the St. Patrick’s Day Parade 2008 live on the homepage of the site and it was a huge success. We had viewers watching live from the U.S.A, Australia, New Zealand, U.K, Germany, France, Spain, Poland, India, Canada & Ireland. although the live stream was 43mins long I edited the stream down to 9:50secs for the main parts which you can view below. Below are some photos taken by my brother Gerard McCarthy of the event on the day. By the way thats myself on the DV camera. We have posted 39 news articles including photos in less than 5 weeks and continue to post daily. The Online Video section of the site is proving very popular. Traffic to the site has increased by an average of 30% each week, which we are more than pleased. We are also getting local business interest in sponsored advertising so I will have to work on that strategy next! That’s all for now…. short note: I have a nice “Band/Musicians” template module in the making which I will post up here for free download soon. Ticketmaster.ie – Where Are The Cheap Seats? I’ve come to realise a strange pattern when booking ticket online using ticketmaster.ie First off when I am logged into my account with them and I’m searching for tickets why is it that I can never book the lower advertised (cheap seats) prices? its like those prices don’t exist for online users. I say this as having bought quiet a lot of tickets this year alone from them. A recent example was buying 2 tickets for a friend for the “Prince” concert in Croke Park this summer. The morning of the sale I was logged in prior to the 8:00am ticket sale and as soon as online booking started I proceeded to book 2 tickets but no matter what way I tried to book I had no choice but pay the premium price of €126.50 + booking fee per ticket as apposed to the much cheaper €66.50 per ticket, I just don’t get it! Same scenario booking tickets for “Wwe Raw – Wrestlemania Revenge Tour” Belfast, I’m taking my two sons to that event as they are completely into wrestling at the moment, well they’re aged 11 and 8 so it will be a mind blower for them, but tickets for that event were advertised at €20 and €55 per ticket and guess what Yep! I had no choice but pay the premium again online. Anybody out there manage to book standard tickets with ticketmaster.ie online? I’d like to know? YoughalOnline.com is the website for online community news, with fresh content, local news articles, and photos/video on a daily basis. Developed from an idea by Michael Hussey an excellent local photographer and journalist and myself coming from a web development background. The idea was to keep the content fresh and incorporate photos and video with the news articles, call it a news/photo/video blog. There are several other Youghal related websites but we felt neither updated their sites regularly and their content was stale. Allowing people to comment and interact with news articles will be a welcome to some people as a way to air their views and also to get users opinions on local issues. We are developing an online video section which will feature Youghal related videos from around the web coming from sites such as YouTube, Revver, MySpace, Bebo and many others. This video section will also feature live web cam events as they happen. The live video will also be available to view after the parade at YoughalOnline.com as we will have it archived for future viewing. Just a quick post to say I’ve been “up the walls” with various projects over the past few weeks, a nice tutorial is on its way of my experiences with Google Maps. I’ve been implementing the maps on a property site I’m developing at the moment and had a bit of fun pushing the possibilities there. Also started teaching “Digital Photography” & “Webpage Design” at the local school, these are adult night classes and take some time to prepare but I really like the challenge and of course returning to the basics myself. I came across this really handy site to convert: PG, GIF, PNG, BMP, TIFF files to vector format, it’s a free online auto-tracer. handy to keep an eye on for a cheap laptop or pc. They are refurbished and fully serviced and come with 12 month warranty. Some days there is 30 to 40 products available other days only 1 or 2. They are only available to Ireland or shall I say post to Ireland only. Any stories from people who have bought from here good or bad reviews would be interesting? I was busy last weekend shooting a music video for hip-hop artist Sandyman B for a soon to be released track called “I’m In Love”. It is early days for the video and many editing hours to come but I shot some really nice footage which I will blog about over the next few weeks with a few example shots from behind the scenes. 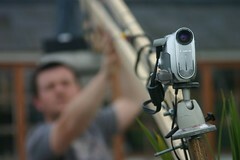 I used my homemade camera crane to take some unusual video angle shots. This crane was built by my friend Frank McQuillan based on on some plans that Frank, Mark Waters and I had come up with in April 2007. It was built as a prototype with wood, roller blade cogs, an old tripod speaker stand and various other bits and pieces. The cost was about €50 for materials. 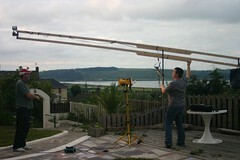 Below is an example video shot with the homemade jib crane and already it’s been viewed 8,355 + times on YouTube. Also below are some photographs my brother Gerard took when we tested it out back in April 2007. 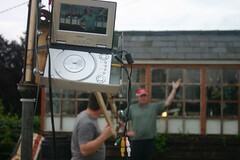 We even mounted a portable DVD player as a monitor on the pole using an old computer tower case cut and bent into shape, at the moment it only takes my small Canon MV890 camera but the shots are very pleasing. Below is the video we shot that day while experimenting with the crane, it’s of my other brother Martin who is a very enthusiastic DX Radio operator.